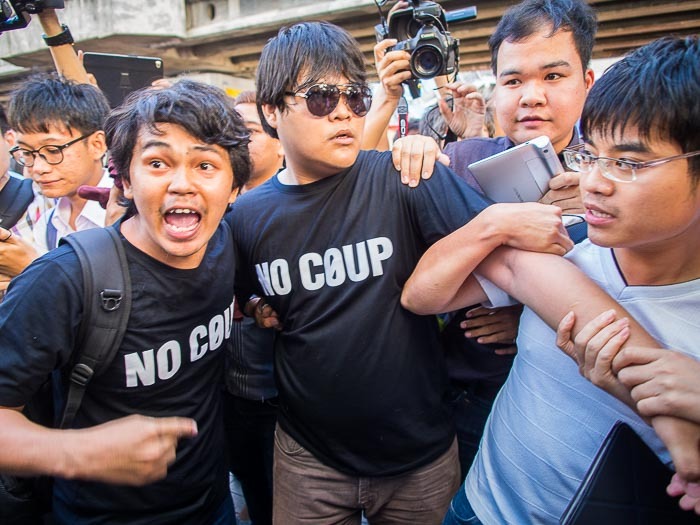 People opposed to the May 2014, coup scuffle with supporters of the military government in front of the Bangkok Arts and Culture Center Saturday. Thailand has been under martial law since the coup that deposed the elected civilian government on May 22, 2014. People who speak out against the coup or Thailand's nascent reform process are called in by security officials for "attitude adjustment." 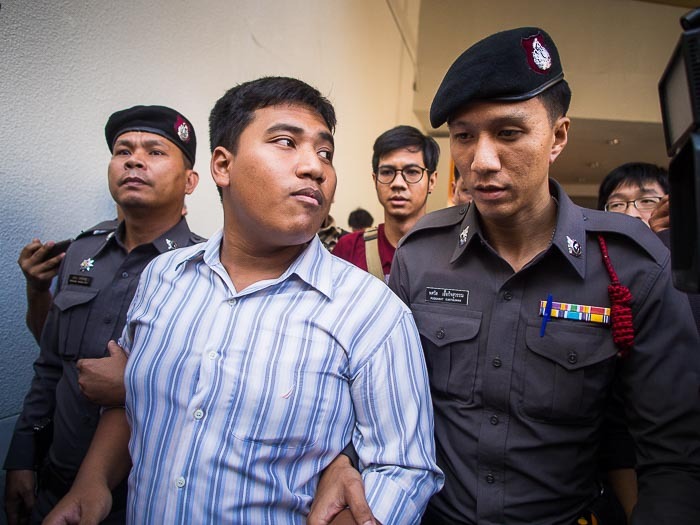 They're usually held in detention for a few hours (or days), questioned and then released after signing a pledge to not get involved in politics. The military says these steps are necessary to heal Thai society, which has been ripped apart by the various protest movements (which protest movement depends largely on who is in office at the moment). Opponents say "Martial Law" and "Attitude Adjustment" stifle free speech. Police detain a university student for using a bullhorn without a permit. His attitude was adjusted and he was released. There was a protest Saturday at BACC, across the street from MBK, a mega mall in the heart of the city. About 50 people showed up with mock ballot boxes and roses (it was Valentine's Day after all) to protest the lack of democracy in Thailand. One democracy advocate told me the protest was to mark the one year anniversary of the aborted election of February 2, 2014. The election was cancelled after anti-democracy gunmen attacked several polling places, forcing their closure. A police officer watches protestors. Saturday's protest was small, maybe 50 people, certainly less than 100. But it's significant because it was the first public protest of any size since June. 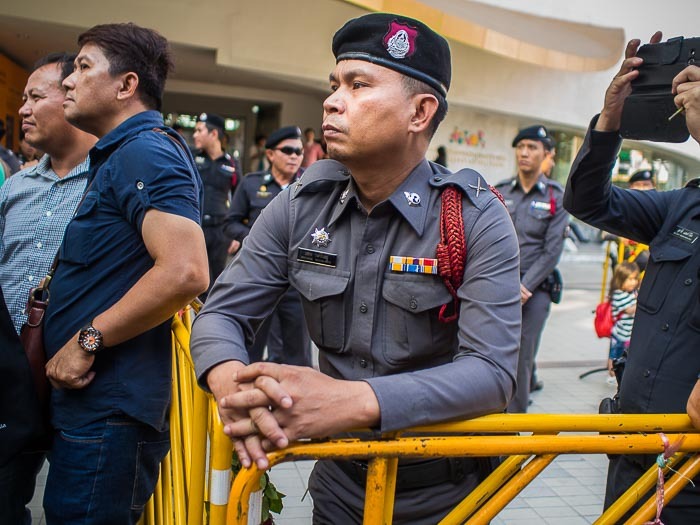 The military is still very firmly in control, but this protest, coming after two very small IEDs were detonated at a Bangkok mall and university students unfurling anti-coup banners at a soccer game means that martial law will continue. 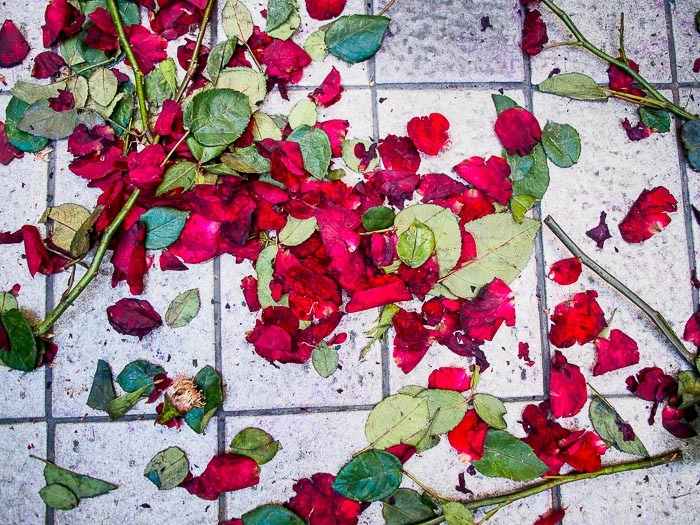 Roses on the sidewalk after the protest.